We're the first to admit that roulette is our favourite game. When we set foot inside a land-based casino, we bypass the slots, don't even acknowledge the blackjack tables, and barely pay attention to the action in the poker room as we dart straight toward the roulette tables. But here's the thing. As much as we love roulette, we barely make it out to a land-based casino. The scene we just described above? It hasn't happened in years. That's not because land-based casinos are too far away. They're actually pretty close. We've got two of them within a 15-minute drive. Still, we'd much rather play online roulette instead. This isn't just about the potential to make more money, nor is it about the speed of the game - both of which we really love. It's about so much more. Keep reading to find out the big advantages of playing online roulette. It's way more convenient - Not everyone lives around the corner from a casino. But if you're reading this, you've got an online casino right in your house. The same Internet connection you used to read this article gets you fast access to online roulette games. No jumping in the car. No filling it up with gas. No driving miles and hours. You can choose your stakes - There's no way you'd find a $1 roulette table at a land-based casinos. The big properties want you to lay down at least $10 per bet. But online? You can play for as little as $1 per spin. Actually, strike that. You can play for as little as $0 per spin. Many online roulette sites will let you play for free, so you can enjoy the tables without risking one red cent. It's easy to beat the crowds - Don't worry about fighting for a spot around a crowded online roulette table on a Saturday night. At online casinos, you're the only one at the table. That means there's no fighting for an open seat and no waiting for an open table. You get to set the pace - At land-based casinos, you need to wait for the dealer to spin the wheel, and he needs to wait for players to get their bets in. But online, you call the shots. Place your bets and hit spin the second you're ready. With less time between spins, you've got more opportunity to win. You can play at 4 in the morning - Can't sleep? Jump online and play online roulette. Whether it's 4 in the morning or 4 in the afternoon, an online casino is always open and easy to get to. Don't worry about showering - Despite the latest advancements in technology, your PC or Mac can't smell you. That's good news if you'd rather just chill at home and play online roulette in your PJs. And that's especially good news if you haven't stepped out of those PJs in days. Comp points are easily tracked - Ever sit down at a roulette casino and totally forget to hand over your loyalty card? That doesn't happen online. Every wager you make is completely tracked. The online roulette site knows exactly how much you've wagered, so they can reward you with incentives the second you earn them. You can play at two casinos simultaneously - Not even the maddest of mad scientists can be at two places at once. If you love two casinos and can't decide which to play at, you'll need to flip a coin and choose. Online, though, it's a different story. 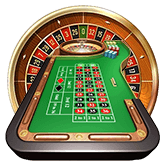 There's nothing stopping you from opening up more than one online roulette casino and trying your luck to see which one is more lucrative. If you're playing for free, it's also a great way to figure out which casino you like better. Convinced that online roulette casinos are the way to go? Read our reviews on some of the top roulette casinos on the Internet and discover which site is perfect for you.